It is with much sadness that we report that Dr Rosalys Coope, our much-loved former President, died at Christmas at her home, with her family around her. This obituary has been written by her colleague, co-author and Thoroton Society member Pete Smith. After serving in the WRNS during the 2nd World War Rosalys gained a place at the Courtauld Institute (London University) to study Art and Architectural History. 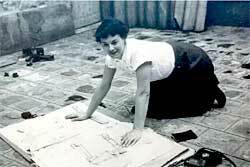 Her interest in architecture and her fluency in French chimed exactly with the interests of one of her professors, Anthony Blunt, and she went on under his guidance to complete her PhD thesis on the important French architect Salomon de Brosse (1565-1630). The resulting monograph Salomon de Brosse and the Development of the Classical Style in French Architecture from 1565 to 1630 was published by Zwemmer in 1971. Blunt also encouraged her compilation of a Catalogue of the Drawings by Jacques Gentilhatre, a rather less well-known French mason-architect closely associated with de Brosse, which was published by the RIBA in 1972. Rosalys worked as assistant to Sir Kenneth Clark prior to her marriage to Peter Coope in 1951 and her move to Epperstone in Nottinghamshire. Her researches continued soon after the birth of her two daughters with her husband’s wholehearted support. From the 1970s, she turned her attention to English architecture, beginning what was to become a long-term study of nearby Newstead Abbey, famously the former seat of the Byron family. This began with a single article in the Transactions of the Thoroton Society published in 1979 and was followed by five further articles exploring over 400 years of the house’s history. When it was suggested by her son-in-law, Bob Lumley, that publication of all these articles together would be a fine way to celebrate her 90th birthday, Rosalys leapt at the opportunity, though her lack of computer skills meant some assistance was required. Fortuitously I had recently taken early retirement and was able to assist her with editing and revising these articles for the book. Rosalys and I then spent a couple of gloriously happy years crawling all over the building, arguing about details and pictures and documents with the invaluable assistance of Haidee Jackson, the enthusiastic curator of the Abbey. The book finally appeared in 2014 as Newstead Abbey; A Nottinghamshire Country House: its Owners and Architectural History in the Thoroton Society Record Series, vol. 48. The book reflects not only her skills as an architectural historian but also her curiosity about the owners of such houses and their often-complex lives. During the 1980s Rosalys also turned her attention to the subject of the gallery, and the two articles, The gallery in England: names and meanings and The ‘Long Gallery’: its origins, development, use and decoration, which appeared in Architectural History in 1984 and 1986 respectively, were in some ways her most significant contribution to English architectural history. 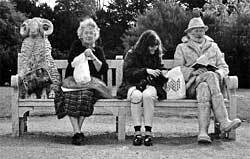 Rosalys enjoying a picnic lunch at Rufford Abbey with Elain Harwood. My abiding memory of Rosalys was the first time I heard her speak at a conference in 1982 entitled Archaeology and the Country House at the Society of Antiquaries where she was a fellow for over 50 years. After a number of interesting, though rather dull, professional archaeologists had spoken Rosalys, with her stories of following workmen, especially electricians, around the house as they took up floor boards or removed pieces of panelling for maintenance purposes in search of new evidence about the house, captivated her audience. Here her good humour, enthusiasm and somewhat false modesty about her skills and knowledge were a breath of fresh air after the rather solemn pontification of other speakers. I only got to know Rosalys well after assisting with the organisation of the Society of Architectural Historians of Great Britain’s Annual Conference in Nottinghamshire in September 1989. Rosalys particularly enjoyed these annual conferences where friendships were made and renewed and where people experienced and argued about buildings of all types and all periods. She was also an enthusiastic supporter of the week-end conferences organised by Malcolm Airs on the Great House held at Rewley House in Oxford between 1990 and 2005. At the same time Rosalys was a long-term contributor to the Attingham Summer Schools and a regular attender of and contributor to the annual colloques at the Centre d’etudes superieures de la Renaissance de Tours in France where she introduced English scholars to a wider public. She shared her love of French architecture of the 16th and 17th centuries with those who were lucky enough to be part of the visit to Tours she organised for the Society of Architectural Historians of Great Britain in 1998. The last of her generation, Rosalys finally fell of her perch (as she referred to it) peacefully at home with her family around her at the tender age of 97. Rosalys Coope, long serving member of the Thoroton Council, Chair of the Council 1984-92, and President of the Society 2008-14, died on 26 December 2018, and was buried at Epperstone on 29 January 2019. Present at the funeral were the current President (Adrian Henstock, with his wife Valerie), the Chair (John Beckett), Honorary Secretary (Barbara Cast), Honorary Treasurer (John Wilson with his wife Janet) and nine other officers and members (past and present) of the Council. The funeral was conducted by Rev Michael Brock, and the formal tribute was delivered by Professor Maurice Howard, University of Sussex. This obituary notice concentrates on Rosalys’s local interests. Elsewhere in this newsletter Pete Smith’s obituary written for the Society of Architectural Historians (and reproduced with permission) assesses her contribution to architectural history in Britain and France. I have also had access to Professor Howard’s obituary, written for the Society of Antiquaries’ online newsletter ‘Salon’ and published in February 2019, and a recorded interview dating from 1990. Rosalys Coope (nee Torr) was born on 13 November 1921 at Steyning, Sussex, and died at Poplars, her home in Epperstone, at the age of 97. Following her marriage, she adopted the name Torre as a second forename, with the additional ‘e’. Rosalys was brought up in the south of England, together with her elder sister Pen[elope]. Their mother died when Rosalys was just ten months old, and her father subsequently re-married so that she acquired two half siblings, Iris and John. Relations within the new household were not always easy; consequently in the 1930s Rosalys was educated in Switzerland and Italy. In 1938 she stayed in Florence in a house harbouring Jewish people waiting to escape. She was present at the opening of the new Florence railway station, and also witnessed Mussolini in full flow from the famous window at Palazzo Venezia, Rome. During the Munich crisis she moved to Paris where she caught up with her sister Pen and, during the Second World War, she became a WRNS (Women’s Royal Naval Service, colloquially Wren), serving in Ceylon towards the end of 1944. After the war, Rosalys returned to Britain. She had no formal educational qualifications, so she took a degree at the Courtauld Institute to study Art and Architectural History. Her tutor was the art historian Margaret Whinney, and she was taught by (amongst others) Anthony Blunt, who was later exposed as having been a spy in the 1930s. Through Blunt, Rosalys added an interest in French architecture to her pre-war experience of Italian art. Following her graduation, she spent time in France researching 16th and 17th century French architecture. When she returned to England, she became personal assistant to Sir Kenneth Clark, perhaps best known for his 1970-1 television series and accompanying book Civilisation. In London, at a party given by Pen, Rosalys met Peter Coope whom she married in 1951. They moved temporarily into a house in Burlington Road, Sherwood, while they sorted out Poplars, the house in Epperstone where they lived subsequently. While Peter was busy with his career in accountancy, Rosalys found time to integrate herself into local life. When they married, she had received from Peter’s father a string of pearls and a ‘share’ in Bromley House Library. It was, she recalled many years later, the done thing to join Bromley House, and her father-in-law also suggested that she open accounts at Skinner and Rook, wine merchants of Long Row, and at Burtons, Smithy Row. She was also told that she should join the Thoroton Society. Both she and Peter became members although she was the more active. Their introduction to the Thoroton Society was through Margaret Whinney, who knew John Holland Walker, the long serving Honorary Secretary, and his wife. The Holland Walkers invited the newlyweds to dinner at their home in The Park. Rosalys recalled the fact that they had two puddings - a rare extravagance in post-war austerity Britain. Rosalys, with Peter’s enthusiastic support, continued with her architectural research, and began doctoral work following the births of their daughters Helena and Clare. Her chosen subject was early 17th century French architecture, and her thesis was later turned into a book: Salomon De Brosse and the Development of the Classical Style in French Architecture, 1565-1630 (Zwemmer Studies in Architecture, 1971). She was awarded a doctorate on the strength of this excellent monograph. She was elected a fellow of the Society of Antiquaries in 1961. Rosalys also published in Architectural History, and among her other achievements she researched (with Maurice Howard) the history of The Vyne, a National Trust country house in Hampshire. Bromley House was particularly useful for her research since, without an academic affiliation, she relied for many years on the library’s book lending service operated through Harrods. than 40 years after they first met. Her growing interest in Newstead and its owners is clearly set out in the preface to her Thoroton Record Series book, published in 2014. In 1955, Rosalys joined the Council of the Thoroton Society. She was not the first woman on Council. Mrs Burton and Miss Reddan had been members for several years and, in conformity with the style of the times they were known by their titles - hence ‘Mrs Coope’ - whereas the men were all identified by their initials. It was here she met Miles Thoroton Hildyard, Maurice Barley, Keith Train, Professor A.C. Wood and other male stalwarts of the Society. The male stalwarts were not greatly enamoured of the young lady (34!) with two small children whom they thought Holland Walker had thrust upon them, and several, among them Stan Revill, complained. Fortunately, Rosalys was unaware of this at the time: she found the experience of being on the Council initially rather daunting. Revill told her the story only when she became the Society’s first female chairman of Council on 17 May 1984. She served in that capacity until April 1992 when she stood down claiming that she was about to fall off her twig - a colloquialism regularly repeated over the next 26 years! Subsequently Rosalys became the first female President of the Thoroton Society in 2006 and served until 2014, regularly attending lectures, and always at the Spring Meeting, which included the AGM, and Annual Lunch. Her contribution to the academic work of the Society was almost entirely focussed on Newstead Abbey, on which she published eight articles in volumes 74, 83, 91, 95, 101, 105, 111,115 as well as the highly acclaimed Record Series book in 2014: Newstead Abbey: a Nottinghamshire Country House: its Owners and Architectural History 1540-1931 (Thoroton Society Record Series, 48, 2014), which was shortlisted for a prize from the Society of Architectural Historians. Pete Smith recalls that the book reflected ‘not only her skills as an architectural historian but also her curiosity about the owners of such houses and their often-complex lives’. Her final contribution to Transactions was a shorter piece put together with Pete Smith in 2017 on watercolours at the house. At Bromley House she became a Director in 1988 and served in that role until 2005. It was during this period that the Library moved from being a business (hence the shares which members were expected to hold) to a charitable trust, a move of which she wholly approved, partly because she was concerned that the local businessmen who had previously dominated the board were secretly more interested in selling the books to keep the library solvent than developing its intellectual and academic base. Rosalys edited, with the librarian Jane Corbett, a book about Bromley House at the time of the library’s 175th anniversary, published in 1991: Bromley House 1752-1991: four essays celebrating the 175th anniversary of the foundation of The Nottingham Subscription Library (1991). As part of the research for the anniversary she was interviewed by Steph Mastoris and I have included some of her comments on that tape in this obituary notice. She is remembered at Bromley House as much respected by staff and other directors. 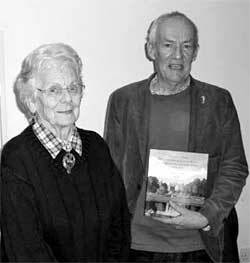 Rosalys was also involved in Epperstone village life, serving at one time as Chair of the Parish Council. Not surprisingly, her particular interest was in the heritage of the village, but she also participated fully in the social life of the community. Stones were never left unturned, and none of those who packed into Holy Cross Church, Epperstone, for her funeral were surprised to find that she had left three pages of instructions, and that the service had to have proper hymns - notably Eternal Father Strong to Save, which she recalled singing as a WRNS - readings from the King James Bible, and the traditional service. Many Thorotonians will be unaware of Rosalys’s broad range of architectural historical interests, or that she travelled through much of the Middle East, and as far north as the Arctic Circle. I have tried to put right that omission. In his tribute, Professor Maurice Howard described Rosalys as a ‘loving, warm person’. She was, and we are all the worse off for her passing. Part of Steph Mastoris’s taped interview with Rosalys (1990) will be played during afternoon tea at the Spring Meeting in Caunton on 27 April 2019. Rosalys was a remarkable character as well as a great scholar, especially of her beloved Newstead, and an asset to the Society. I’m so pleased that she lived long enough to see her magnum opus on Newstead published - Adrian Henstock. She was a remarkable lady who will be sorely missed. Yesterday I walked up to Old Ox, the Iron-age hillfort overlooking Oxton village with my husband and granddaughter Annie and I remembered another walk. This was with Rosalys when we were preparing for the Millennium wapentake events - twenty years ago back in 1999 - it was a very special day walking with Rosalys up that hill and a very special remembrance of it this year.